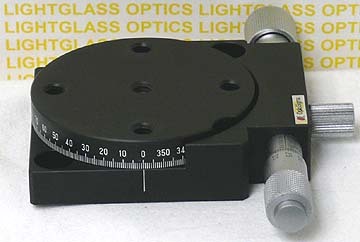 The OptoSigma 124-0055 Metric 65mm Rotation Stage is micrometer actuator driven for fine adjustment, and manually rotated into rough position. The top of the stage is drilled and tapped with 5 M6 holes on 1 inch centers for easy mounting of other optomechanical components. The base is drilled and counterbored on 2 inch centers to mount this stage to your optical table.